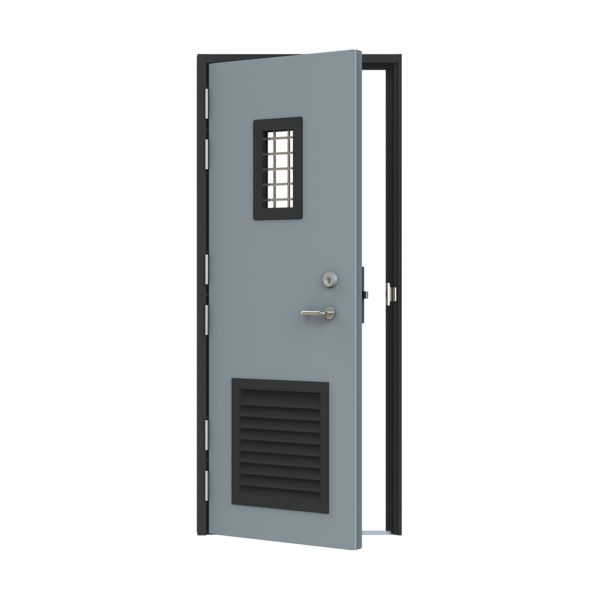 Single, double, and leaf and half outward opening doorsets, or single inward opening doorsets available. Available with fixed side and/or over panels. Certified by the LPCB to LPS 1175: Issue 7 Security Rating 4. Optional CERTIFIRE fire rating up to 240 minutes. 66mm door leaf construction, manufactured from 1.5mm THK Zintec steel. 110mm single rebate frame, manufactured from 2.0mm THK Zintec steel. 6no. hinges, c/w 9no. heavy duty steel hooked dog bolts to each leaf. 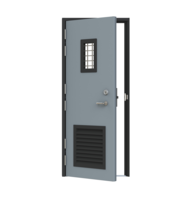 Full range of MICO Abryll single point locks, with a range of external access options available. Heavy duty tower bolts fitted to passive leaf on double and leaf and half doorsets. Vision panels and bladed louvre cartridges available in a variety of sizes and configurations. Primed or polyester powder coated in a wide range of colours and finishes. Available in a high-quality wood grain effect finish. Optional Extra Life paint, offering up to 10 years’ anti-rust warranty.